The Eau Claire Express play an active role in the Chippewa Valley, appearing at various events throughout the year. Whether it’s Trax or Trix appearing at your parade or fundraiser, players interacting with your school or a front office member performing a speaking engagement about the sports industry or the upcoming season, the Express are sure to be able to add value to your event! If you’d like an Express representative to be part of your event, call the main office at 715-839-7788. Trax and Trix are available to appear at your event any time during the year! They commonly attend or participate in parades, charity walks, fundraisers and youth events. To schedule an appearance by Trax and/or Trix at your event, contact Jacob Servais at the Express office at 715-839-7788 or jacob@eauclaireexpress.com . 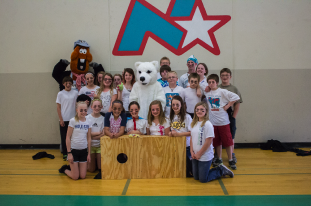 Trax and the interns joined the students of Northstar Middle School in Eau Claire for their bag toss event in 2013. During the season, Express players regularly make appearances throughout the Chippewa Valley. Most of these appearances are centered around youth events, but the team has been known to volunteer at the Community Table and participate in tours of the Career Development Center among other things as well. 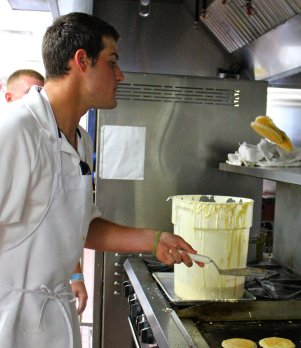 Appearances with the players are limited to days when the Express has a home game. Times the team is available and duration that they will be at your event are limited. 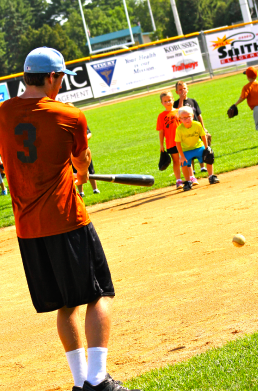 To inquire about having Express players part of your event, contact Jacob Servais at the Express office at 715-839-7788 or jacob@eauclaireexpress.com. Members of the Express front office are available for speaking engagements in Eau Claire and the surrounding areas. Whether it’s talking about the sports marketing industry, the Express season or giving career advice to students, the Express has you covered! To request an appearance by a front office staff member, contact Andy Neborak or Jacob Servais at the Express office at 715-839-7788, aneborak@eauclaireexpress.com or jacob@eauclaireexpress.com.